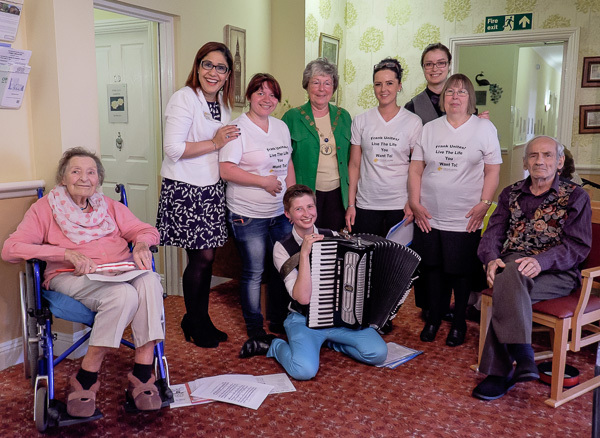 On Friday the 20th June 2014, Frank Foster House Care Home in Theydon Bois, opened its doors to the community, and united to celebrate the National Care Home Open Day. 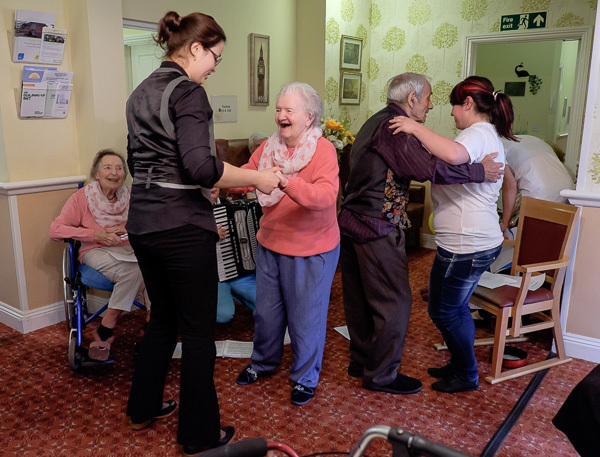 There were various events and activities throughout the day including Guided tour of Frank Foster House, Resident’s art Gallery and Frank Foster Choir together with singing and dancing. To mark the occasion, the Vice Chairman of Epping Forest District Council Liz Webster visited and stayed for about an hour. Please add Landmark Trees Competition and/or Tree Donation Scheme to the Subject Line of the e-mail to make sorting easier. ALTHOUGH FORMS CAN BE RETURNED AT ANY TIME, IT WOULD BE GREAT IF AS MANY AS POSSIBLE WERE RETURNED BY THE END OF JULY. 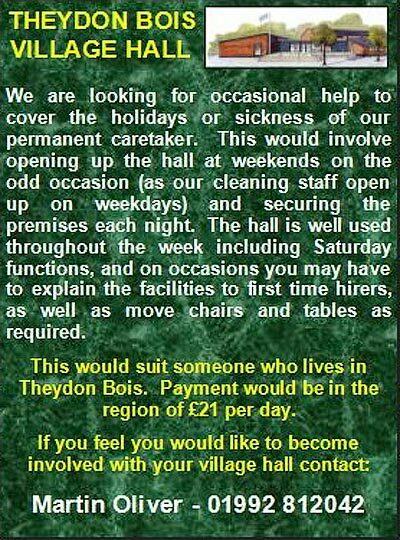 Both Theydon Newsdesk and our Parish Council encourage Villagers to support our local business's. Use them or Lose Them. This is for a two months trial period and started on Monday 12th May, but if successful it will continue. Usual admission is £6.50/£7.50. (with a few “special” events costing £1 more). Bar/Bar Food is available. 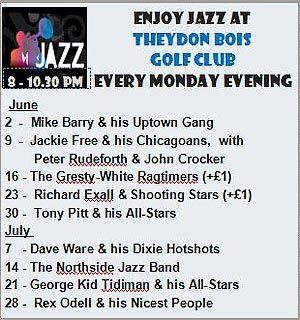 This is great news for Theydon Bois residents who enjoy traditional jazz. The background to this event is the relocation of what has been called the Chigwell Jazz Club from its venue for the past eight years, Chigwell Hall. 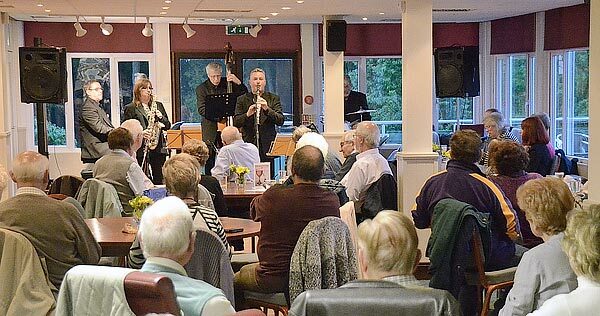 The club is run on a non-profitmaking basis by Dave & Sheila Dyer, a wonderful veteran couple, originally from Chingford, who have made it their goal to keep live jazz going in the area. 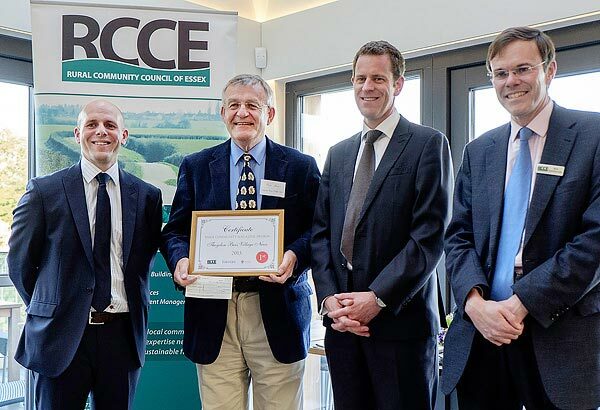 At the recent Rural Community Council of Essex/ Essex Life Community Magazine Awards Village News was crowned Best Community Magazine in Essex for the third time in four years. This is a real achievement in what is a hotly contested competition, attracting in excess of 40 entries from communities large and small, Essex wide. RCCE continue to team up with Essex Life, Newport News and the Diocese of Chelmsford to support and encourage all those who work hard to produce genuine community magazines. This annual competition is open only to editors of not-for-profit community magazines in which editorial work is undertaken on a voluntary basis. The Village News team were very pleased to be short listed once again. Conscious however of the ever increasing quality of the competition, it was with more hope than expectation that members of the VN team headed up the A12 to the Awards Ceremony hosted by West Street Vineyard, Coggeshall. The team were absolutely delighted to hear that once again the Judges felt that Village News is the best of the best. In presenting the Awards, Nick Shuttleworth (Executive Director of RCCE) paid tribute to Community Magazines which are a much loved part of community Life and despite the rise of social media they continue to play an important role in keeping people up to date with what is happening locally. In accepting the Award on behalf of Village News the editor, Tony Ames paid tribute to the team effort which brings Village News to the door of the 1800 homes in the village on a quarterly basis. Many hours of work go into each edition and thanks go to all those who contribute news and articles, to the army of volunteers who ensure that every home gets its copy, to Martin Oliver who proof-reads every edition, to our printing partner, Precision Printing and perhaps most importantly, to the local businesses who provide the essential sponsorship which enables the magazine to be entirely self-financing. Although Village News is a team effort and many play their part, particular tribute must be paid to editor, Tony Ames and web-editor Jim Watts and the immense contribution they have made in building the magazine up over the past 15 years. 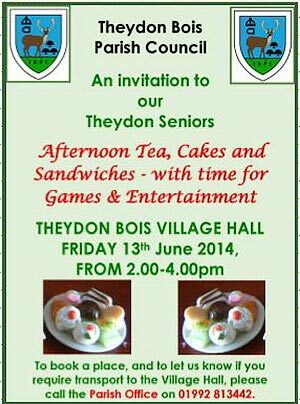 Despite his many years in the ‘hot seat’ Tony retains his drive and enthusiasm to make each edition better than the last and his organisational skills combined with Jim’s technical expertise and photographer’s ‘eye’ are the reason Theydon Bois Village News continues to lead from the front – Well done Tony and Jim! 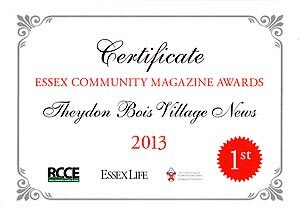 Essex Radio's Dave Monk program this morning interviewed Jim Watts and Nick Shuttleworth (Executive Director of RCCE) about the Theydon Bois win and the growth in popularity of Community Magazines. Elections were held in the Epping Forest district on Thursday 22 May 2014 for European Parliamentary, District Council and a Parish Council By-election. Voters in Buckhurst Hill have elected the first Green Party councillor to Epping Forest District Council. Stephen Neville took the ward of Buckhurst Hill East with 635 votes. The ward was previously held by the Liberal Democrat Group. The other change to the District Council following the local elections on Thursday was the election of a second UKIP councillor. David Dorrell received 428 votes from the residents of Waltham Abbey Paternoster. The ward was previously held by the Conservative group. Total of 58 councillors elected. To avoid a conflict with the Epping Christmas Market the date for our Village Christmas Market has been changed from Friday the 5th December to a week earlier on Friday 28th November. 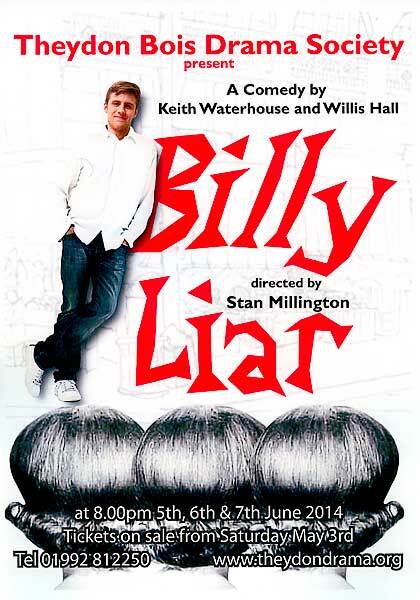 Further details will be available as plans progress closer to the new date. One of the workers we spoke to said he heard the clearance was to do with a car park and perhaps that is why TFL did all the work to the rear entrance last year with the steps and hand rail. Theydon Bois and District Rural Preservation Society and one of our Tree Wardens contacted both TFL and EFDC about the work. No reply has yet been recieved from TFL, but EFDC are following up the matter with TFL as they were not aware of any developments proposed here and TFL have a 'Duty to Consult'. 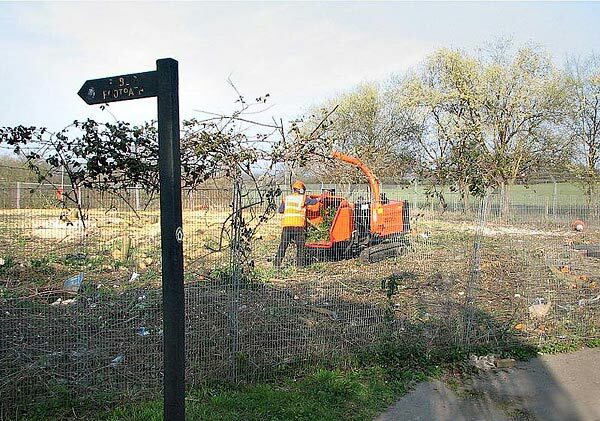 If TFL had consulted before starting work maybe the far corner with the old apple trees, hawthorn, wild rose and brambles could have been kept as part of a landscaping scheme, at least retained something of the history and value of the site for wildlife. 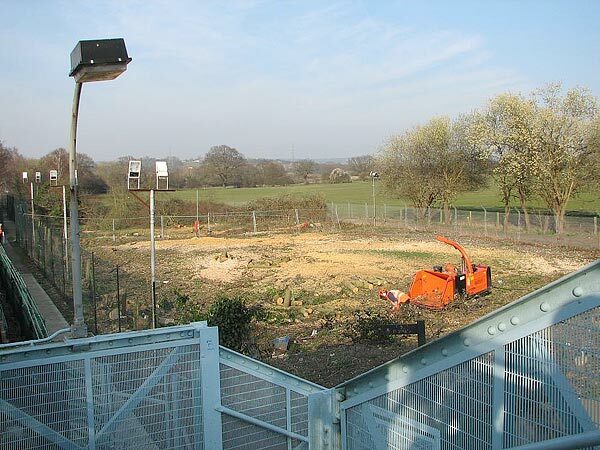 In spite of the fact that Station Hill area in general could do with a tidy up and there also maybe some support for additional commuters parking at the station in a proper car park, it is sad that such a natural wildlife habitat has been destroyed. The rabbits, robins, blackbirds, wrens etc will have to find other homes and it will end blackberry picking along the tarmac road. It has been claimed by some aficionados that the TFL blackberries there were some of the best they have come across! 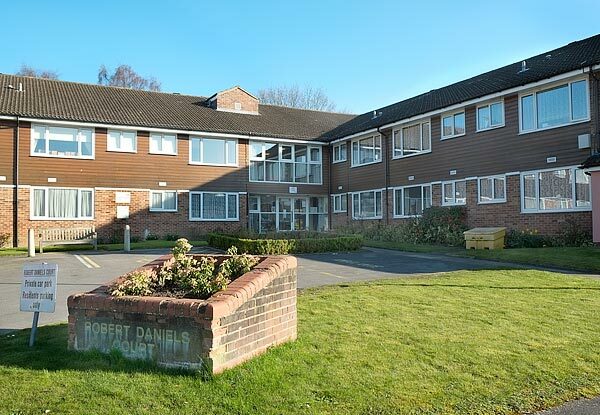 Firefighters from both Epping and Loughton were called to Robert Daniel's Court at 7:10pm last night and helped the Red Cross Essex Fire and Emergency Support Services to evacuate the building. Over Thirty of the elderly residents were evacuated from their sheltered accommodation after their homes were flooded. A burst water tank in the loft of the home, in Thrifts Mead, Theydon caused flooding throughout the building. The building was quickly declared as unsafe and all 36 residents were evacuated and asked to spend the night with family or at a nearby hotel paid for by the housing firm, Home Group. A plumber and electrician were called and both arrived at the home just before 9:30pm as the fire crews carried out work to make the home safe. Jo Huxtable, Home Group interim client services director, said: "We’ve turned off the mains supply after a faulty valve in the roof space led to water leaking into communal areas and flats. "The safety and comfort of our customers is our priority. We’ll repair the valve as quickly as possible but before anyone can move back in we’ll also need to inspect the electrics. "Some of our residents have chosen to stay with family and for others we’re paying for hotel accommodation which includes a meal allowance. We hope customers will be able to return on Monday and we’ll offer all the support we can during the weekend." 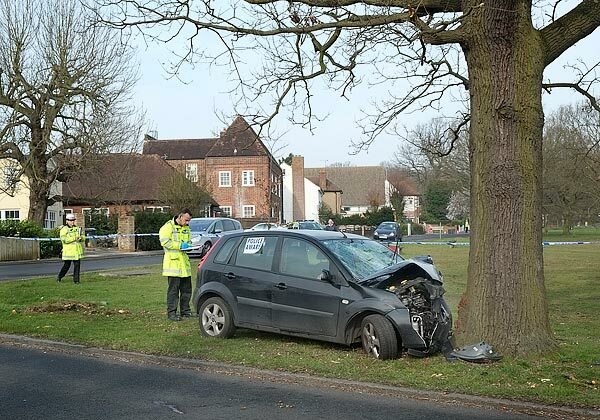 The Police were called and closed off parts of Loughton Lane, Chapel Road & The Avenue of Trees yesterday morning at about 9.00am while the investigated a serious accident following a car leaving the road and hitting one of the Oak Trees near the junction of The Avenue and Chapel Road. The occupants of the car were very badly injured and taken to hospital. The roads were closed for some time and traffic had to be diverted. 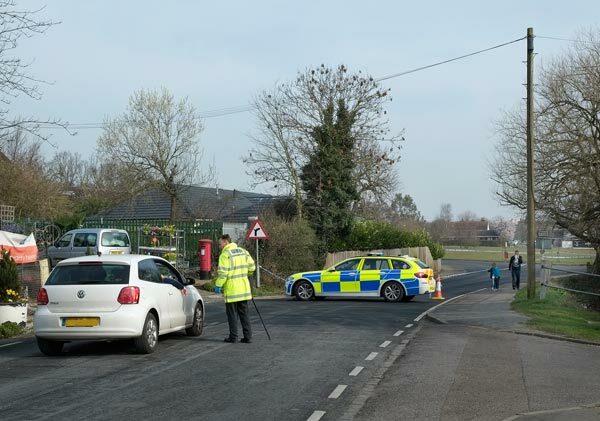 The latest "Burglary Hotspots Report" (28th Feb. - 6th March) supplied by Colin Freeman the police Essex Watch Liasion Officer show an increase in burgalries in Theydon Bois, mainly to the south of the Village Green. Villagers are advised to take extra care to protect their property. More advice on protecting your property can be found here at Crimestoppers. 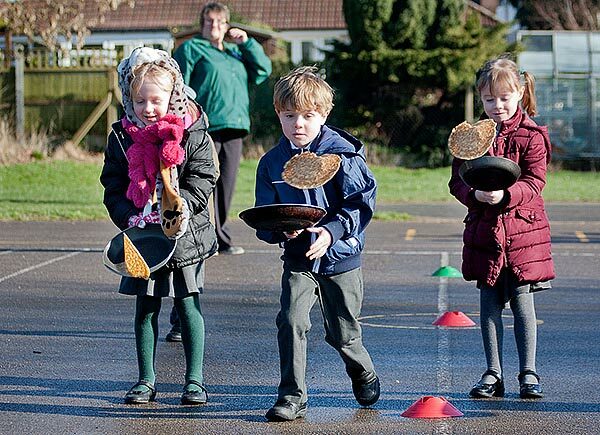 It was a day full of fun and laughter last Tuesday when Theydon's Pancake Day Races in their revived form took place for the fourth year running. Former Parish Council Chairman and Former School Governor John Eaton again helped organise the event with Theydon Bois Primary School's new head teacher Lesley Lewis. 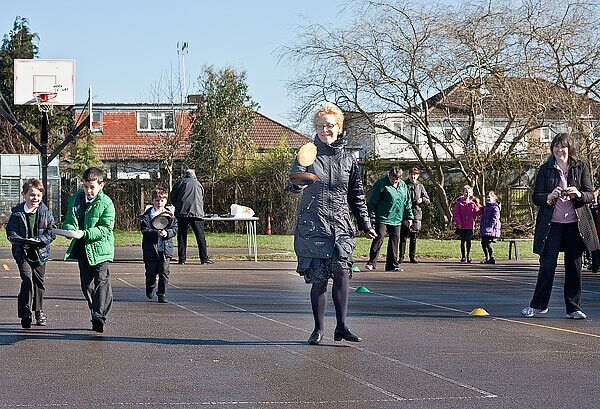 Problems arose this year due to the Green by the Avenue of Trees, where the races are usually run, being waterlogged, but thanks to the efforts of John and Lesley the event was finally staged in the school playground. None of this bothered the children who threw themselves into the event cheered on by their fellow pupils and teachers, some of who could not resist participating in a race or two. 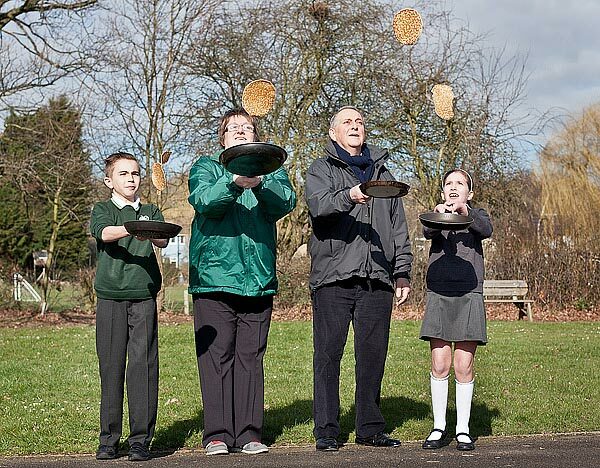 Lesley & John instructed some of the children in how to toss pancakes while running and then started the races. Quite A number of races took place through out the morning and most of the 'tossed' pancakes did not survive till the end! It was a good job that a teacher had been sent out to Tesco to ensure an adequate supply for all the races. 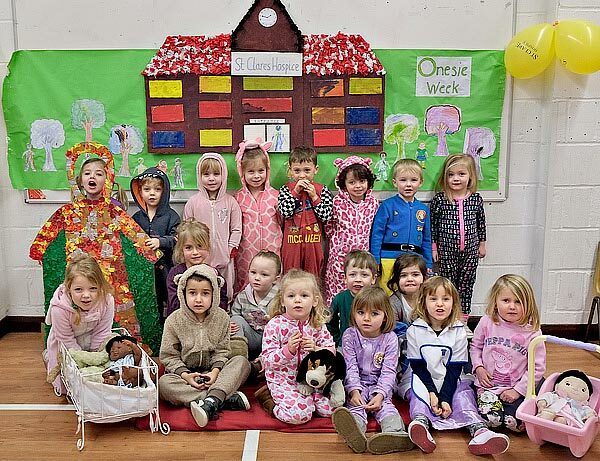 One of the supporters was Theydon Bois Pre-School where the children swapped their normal uniform with Onsies to take part in a Onsie week and support St Clare's hospice. 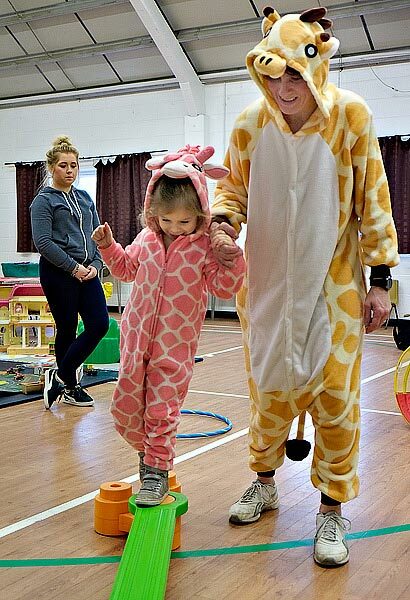 The children were sponsored by their family and friends to complete an assault course wearing their Onsie. They are pleased to announce that they have raised over £300 for St. Clare's so far and the money is still coming in. 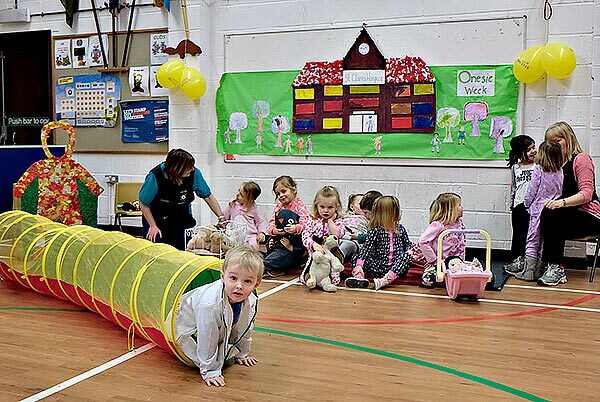 The Pre-School would like to thank everyone who took part. Theydon Bois Balti House very generously hosted a fundraising Curry Night for the primary school's PTA on Monday March 3. The PTA held two sittings for diners at the popular restaurant - an early one for those who wanted to bring their children to try out the Indian cuisine and a later one for those who waned to have a get-together. The evening was well attended by teachers, staff, parents, pupils and carers connected to the school. The resturant staff even commented on how well the children behaved in the early sitting. The Balti House donated half the money taken on the food that night to the PTA which was a generous £441.10. The money will go towards the ongoing fundraising drive to replace the swimming pool changing rooms at the school. PTA joint chair Nik O'Flynn, said: "It was a really good night. 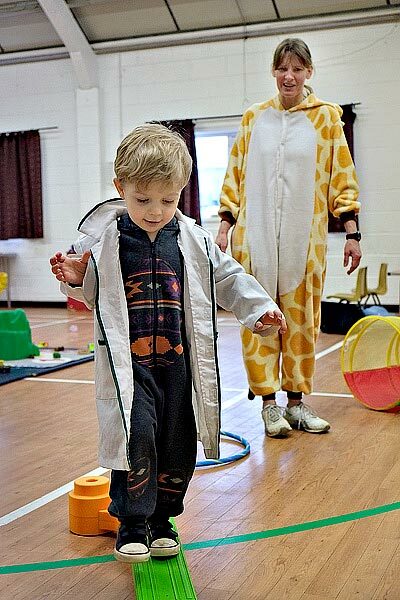 The children seemed to really enjoy it too and it was so lovely having lots of families all in there together. I also popped along to the later sitting to see how it was going and everyone appeared to be having a fantastic time. There may have been a few hangovers the next day though! "It was a really good night out for everyone. "And thanks to the generosity of the Balti House it also raised a substantial amount of money for the PTA which we are extremely grateful for." 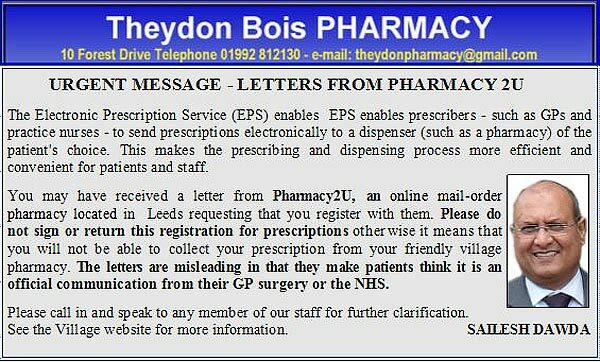 Please note that the advertisement for Theydon Dental Surgery in the latest March 2014 Village News is incorrect. The correct phone number is 01992 813951. Their Ad on the Sponsors Page has the correct number. 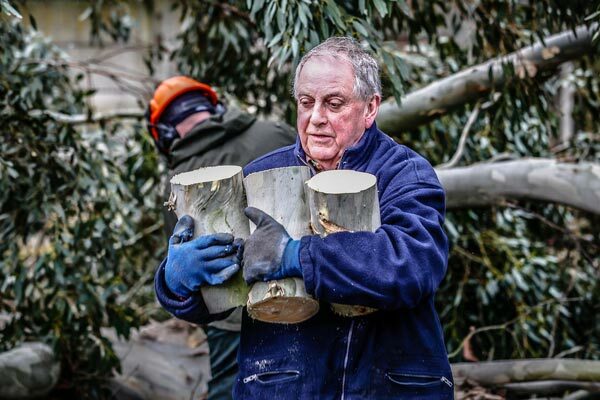 You may well have been unaware of the incident but a large Eucalyptus tree was blown down in the strong winds in the early hours of Saturday morning (14th February). The tree, situated along the back fence of The Queen Victoria public house, was uprooted and fell across part of the Height's car park. 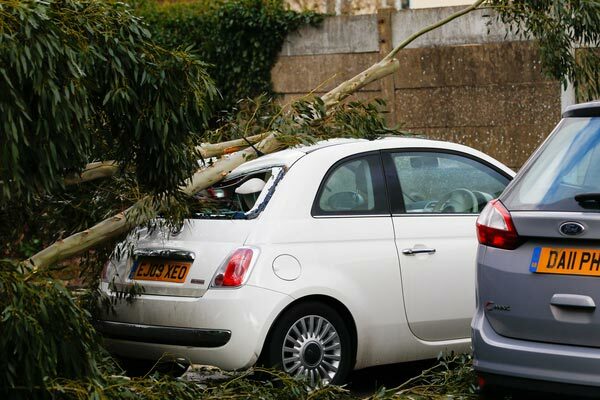 In the process, what was a very smart white Fiat 500 was partially crushed by one of the very long limbs of the tree and ended up being not quite so smart. A number of cars were trapped for some time and a second tree provided a sense of danger as swayed about in the high winds constantly threatening to be uprooted. Theydon Tree Care received a call for immediate assistance from Lesley, publican of the Victoria and Roy Newland, who lives in one of the flats, also called to ask for help. Jonathan recruited an able but ancient groundsman and together they set about the messy task of clearing the limbs and branches. I hastily add that the task was not without risk! Well sort of. Former Chairman of the Parish Council, John Eaton lends a hand. Within minutes, one of the friendly staff of the Victoria had furnished the man with the saw with a magnificent looking coffee topped with small pieces of marshmallow. As soon as Jonathan started his chainsaw and proceeded to start clearing the stricken tree, five residents suddenly appeared to help in the clearing operation. One of the ground floor residents provided coffees to the volunteers as well as being one of the volunteers to stay and help the longest. It was a wonderful opportunity for residents who had formerly only nodded at each other, to get on friendly terms with their neighbours. The lady who provided the coffees needs a special mention because after the clearing operation of the branches and leaves, she stayed and helped to clear the dismantled pieces of bough to the side, some of which were really quite heavy. Tesco's was also shut first thing on Saturday because part of their roof had been affected by the gusting strong winds as indeed the roof of what had been Pierces Bakery, which had lost a number of ridge tiles, an ariel and also suffered from a number of dislodged roof tiles. Members of Theydon Bois Rural Preservation Society attended a tree planting today in memory of former President Alan Gillies (see below). The intension was to plant three trees in the verge in Buxton Road near the corner with Forest Drive. On the day only two were planted immediately with the third delayed because of a problem with existing tree roots. This third tree will be added a at a later date. The original tree variety suggested was Prunus Kanzan, but in fact in the end these were not available, so the Society agreed a different Prunus - a red leafed plum, similar to those further along Forest Drive. Some of these much earlier planted trees have been marked with white crosses and are in now danger of being felled. Previous trees in Buxton Road had been removed some while ago due to "alleged" tree root damage to the corner house. The new trees today have been planted in a special bag that restricts root growth & size for this reason, again this restricts the choice. 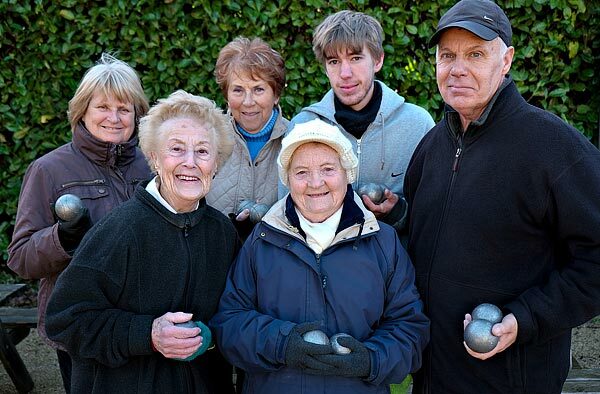 We are the Victorians Petanque Club, playing at the Queen Victoria Public House. We play and park by courtesy of McMullens as their customers. Our ages range from Juniors to Seniors and all those in between. Pétanque is a form of boules where the goal is to throw hollow metal balls as close as possible to a small wooden ball called a cochonnet (literally "piglet") or jack, while standing inside a starting circle with both feet on the ground. The game is normally played on hard dirt or gravel, but can also be played on grass, sand or other surfaces. It is somewhat similar to games like bocce and bowls. It is a very entertaining and enjoyable game. Spectators and New members to our club are always welcome so come along and watch us play or give it a try. Weather permitting we play every Saturday, starting at 11.30 a.m. and usually play for a few hours. Our members take part in the Herts & Essex league, which is one Sunday a month during the winter, and the McMullens league during the summer, which is played once a week on a Wednesday evening. 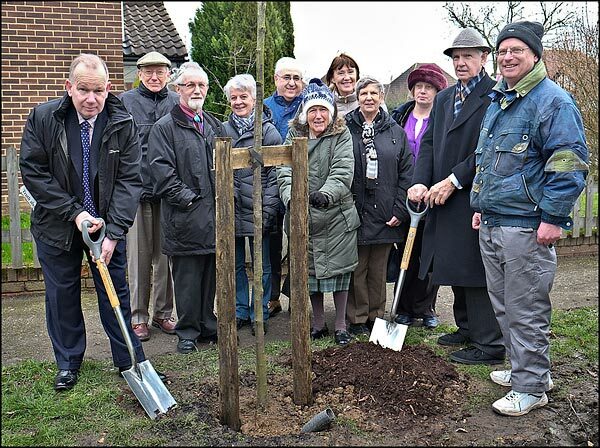 The Theydon Bois Rural Preservation Society has paid for and arranged for 3 trees to be planted in Buxton Road near the Junction with Forest Drive on Wednesday 12 February 2014 at 10.30am in conjunction with Epping Forest District Council and in memory of past president Alan Gillies. All are welcome to attend and please pass on this message to anyone you think might be interested. A VIRTUAL placque will be on the EFDC website. Alan Gillies TB&DRPS President since 2008 died on January 4th 2014, aged 93. Alan had been an active member of the society for many years since moving to Theydon Bois in 1967 and was Chairman from 1985 to 1995. Whilst Chairman he attended the meetings in Chelmsford of the Advisory Council of CPREssex and contributed to the redrafting of their constitution. He was an enthusiastic supporter of anything to do with the countryside and when he was able enjoyed walking in the forest and until Christmas spent time around the village pond, weather permitting. 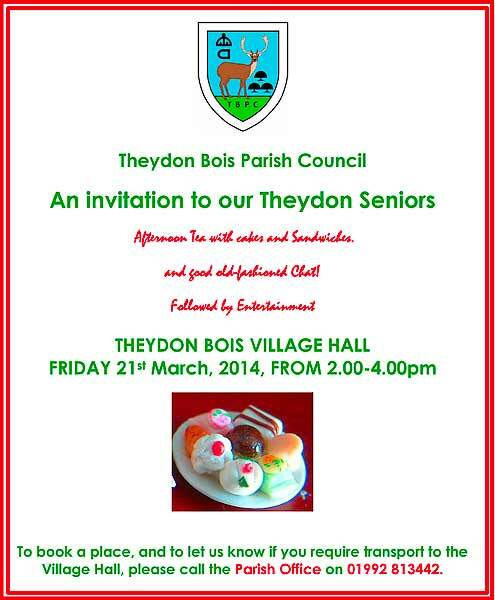 Theydon Bois and District Rural Preservation Society has announced its walks program for 2014. This will again include a walk that takes in the Deer Sanctuary. Last year over a 100 people joined this walk , which is a rare opportunity to gain entry to the Sanctuary. 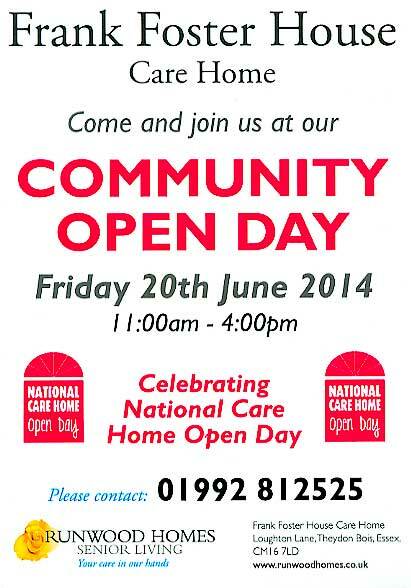 All walks start at 2.00pm from the Village Hall. Sunday May 11th 2013 2.00pm "Into the Deer Sanctuary". Leader Robert Levene. Sunday July 27th 2013 2.00pm "Forest Murmurs" Leader Peter Newton. The Society will also host two talks again this year. One at their AGM on Friday 11th July and the other on Friday 10th October. At this stage the speakers are to be confirmed. Puppy love is in the air at St Clare Hospice now that registration is officially open for our annual Winter Walkies. St Clare housekeeper Zoe Almond, husband Michael and their seven adorable mutts will be among the walkers and their canine companions taking part in the 5km pooch parade starting at the Hospice in Hastingwood on Sunday, February 9 at 11am. Last year, almost 250 people and their four-legged friends took part in Winter Walkies, helping raise almost £5,500, and we are hoping even more people will register for 2014. There will be plenty of doggy fun and games, including competitions for the best dog/owner lookalike and the wackiest wellies, before the walk gets underway, with the 5km rural route taking in the surrounding countryside. Please remember to wear suitable clothing and footwear as it is likely there will be plenty of muddy feet and paws! Dog medals and treats will be handed out afterwards, along with certificates for children. There will also be refreshments. Anyone is welcome to join the walk – whether you are a pet owner or not – but if you are bringing your dog then please remember to take bags for their waste. Advance registration costs £10 for adults and £5 for children, which includes a free soup. Walkers can also sign up on the day. You’d be barking mad to miss it! For more information, call events fundraiser Rebecca Barnett on 01279 773750, email fund@stclarehospice.org.uk or see www.stclarehospice.org.uk. 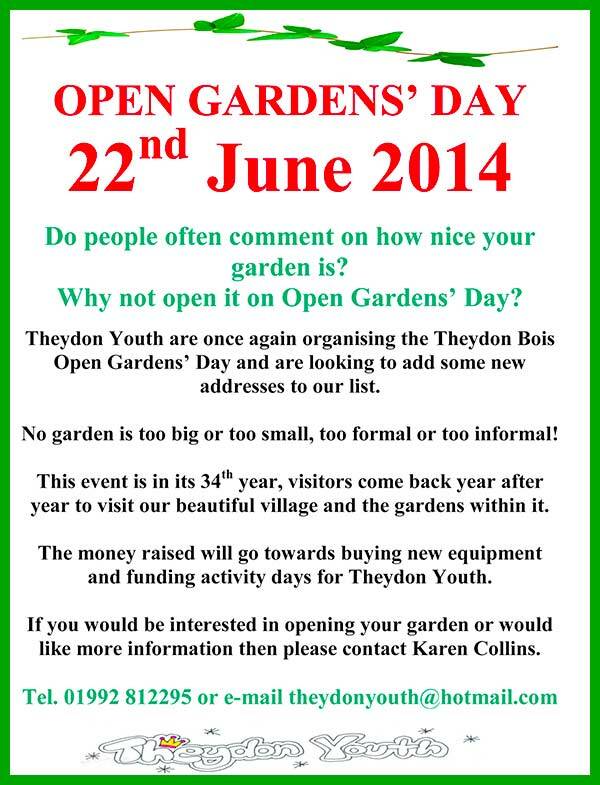 Why not support Theydon Youth and show off your Garden this year. More about Open Gardens can be found on the Open Gardens Day Page. 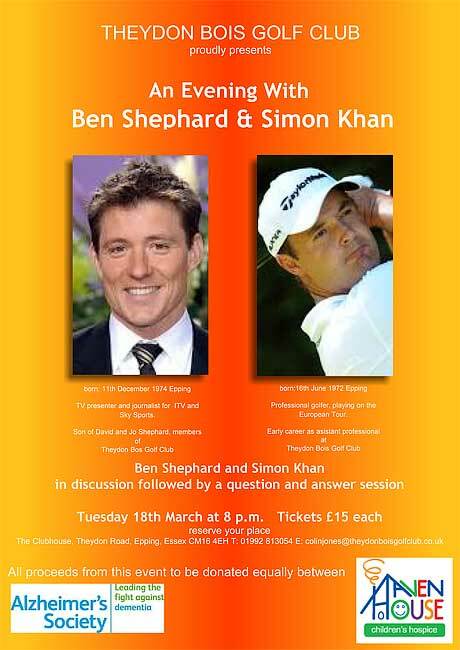 Theydon Bois Golf Club are running a charity evening with TV Presenter Ben Shephard in conversation with Professional Golfer Simon Khan on Tuesday 18th March at 8.00 pm. All proceeds from the evening will be divided equally between the Alzheimer's society and Haven House Hospice. Tickets are £15.00 each. Tel: 01992 813054 to reserve a place. Throughout January and February the LAS are running a series of events in the local community to support BBC Stargazing Live. Details of these and other BBC Partner event can be found here. When Chief Constable Bligh accompanies her friend Diane Tulliver home to Dysart Hall after a night at the opera they arrive to a horrifying scene. Diane’s husband Paul has been shot dead and ex-convict Charley Mirren is standing over him bearing a gun. It appears to be an open-and-shut case for Jessica Bligh, but as she and her colleague Inspector Fremont probe further they discover all is not what it seems. Through a series of flashbacks and re-enactments of the events leading up to Paul’s death, we soon find it is not just the murderer’s identity that is in question. 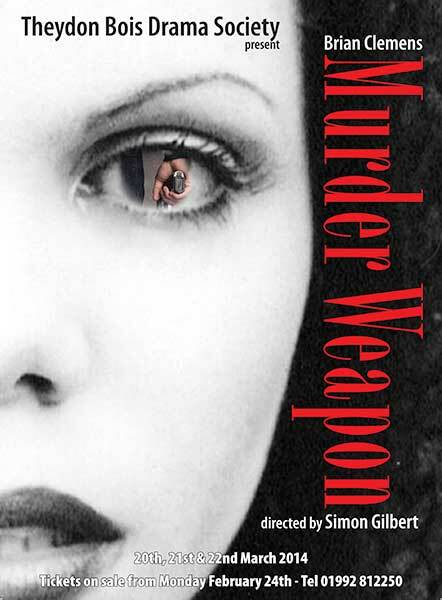 Murder Weapon is an ingeniously plotted, highly tense thriller from Brian Clemens, creator of The Avengers. Chigwell Riding Trust for Special Needs that has help and support from some Theydon Bois Villagers has a very exciting year ahead of them as they will be celebrating their 50th anniversary. Founded in 1964, Pony Riding for the Disabled (as it was previously known), was the first purpose built riding establishment for people with special needs in the world. It was designed and equipped specifically for people with disabilities and special needs and as a result has provided therapeutic exercise and riding lessons for thousands of children and adults. Through riding, people with physical disabilities can be rewarded with huge improvements in mobility, fitness, muscle tone and co-ordination. For some it has been the stepping-stone they need to do something as significant as taking their first independent steps. Chigwell manages to get the balance just right, the atmosphere is welcoming and every rider feels valued and an important part of their riding group. Riders are also taught to respect and love the special horses they ride, being taught aspects of stable management and general knowledge about horses. 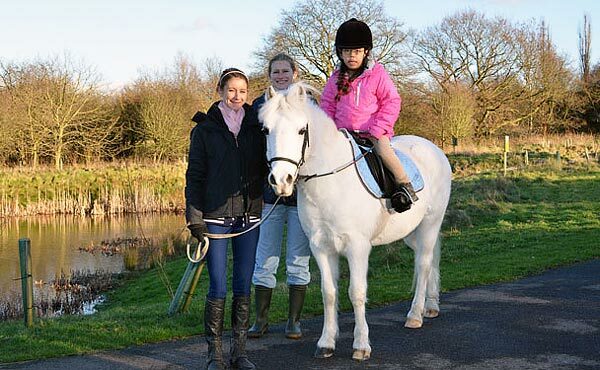 Riding has opened a new world to people with learning disabilities. Those lacking communication skills can often find their first words. For all these riders, confidence and self-esteem has flourished, the pride and achievement felt as each new skill is mastered is something that is shared with the whole group. Riding is quite different to other sports and can really change lives for the better. Often many new friendships are formed whether it be with other riders, parents of children with similar challenges or the wonderful volunteers who return year after year to join in the successes and uniqueness that is Chigwell Riding Trust. To mark the 50th anniversary, Chigwell Riding Trust aim to raise £50,000, £1,000 for each year of their history. This will be through sponsorship, fundraising events and donations. If you would like to be involved in this year’s celebrations or to find out more about the centre please visit www.chigride.org.uk or call 020 8500 6051. Chigwell Riding Trust will be hosting a reunion on Open Day which will be 13th July. The Theydon Bois Primary School PTA will be holding a Curry Night at the Balti House on Monday March 3. There will be two sittings, an early one at 5.30 to 7.30 for families who want to bring their children and a later one at 8pm. We are aiming to fill the restaurant at both sittings so everyone can have a fun night out eating some delicious food while raising money at the same time! The Balti House will give half the takings on the food to the PTA - so please come and eat, drink and be merry! To join in, just call the Balti House on 01992 813850 and book a table for the night (3rd March) stating it is for the PTA Curry Night. 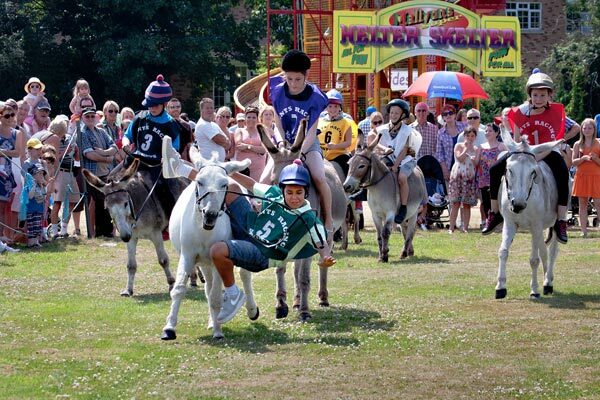 This year's Donkey Derby will take place on Sunday July 13th and preparations are already under way. There is a committee which meets regularly throughout the spring and summer to co-ordinate the event which attracts about 4,000 visitors. Last year's Donkey Derby raised approximately £18,000 for the Scouts and Guides so it is a massive part of village life in Theydon. This year the committee is considering asking some of the other organisations and charities based within the village who work with the young to run some of the stalls so that they too can benefit from this funds raised by the event. The committee is also looking for more volunteers to either help on the day or join the committee and help plan the event. It is always a team effort and many village people put in a lot of hard work to make it happen. 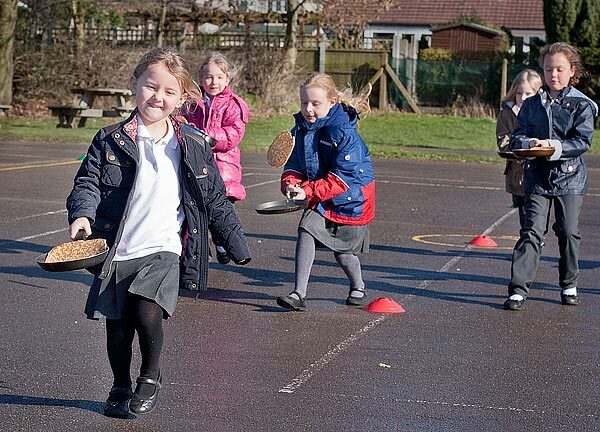 At a packed Parish Council Meeting last night a 'Full Meeting' of the council considered two planning applications from the Theydon Bois Lawn Tennis Club (EPF/2610/13 & EPF/2611/13) for floodlighting at the club. Given the large number of people present representing both sides of the argument Parish Council Chairman John Philip moved this item up the agenda and allowed representative speakers a maximum of 3 minutes each to put their views forward. John at times had to control a rather heated debate taking place in the room. The Tennis Club and it's members claimed that the lighting would be well controlled with limited overspill and would not cause a nuisance or a loss of amenity for neighbours. Their intention was to only use lighting for 3 days a week and only up to 9.30 pm. They would restrict themselves to these hours only. It would benefit the club and its youth mentoring scheme. Representatives of Theydon Bois & District Rural Preservation Society, Theydon Bois Action Group, Loughton Astronomical Society and many neighbours of the club claimed that the lighting would be intrusive, cause a loss amenity to them, disturb wildlife corridors to an from the adjacent Deer Sanctuary and undermine our village 'Dark Skies' policy that is supported by 78.5% of villagers who responded to the survey as outlined in the Village Design Statement that is used to defend our village against inappropriate development in our Green Belt. The days for lighting were not defined so days and times would either not be enforceable or there would quickly be attempts to have them extended. After speakers had made their input councillors considered the applications and unanimously voted (with the exception of those not voting because of declaring an interest) to write to EFDC objecting to the applications. Ed. Note: We have tried to report & accurate and balanced summary of this meeting, but are aware of entrenched positions on both sides of the argument. Readers are advised for a fuller picture they should check the detail of the applications available from the EFDC Website and the VDS and accompanying 'Analysis Document' for themselves before reaching a judgement. 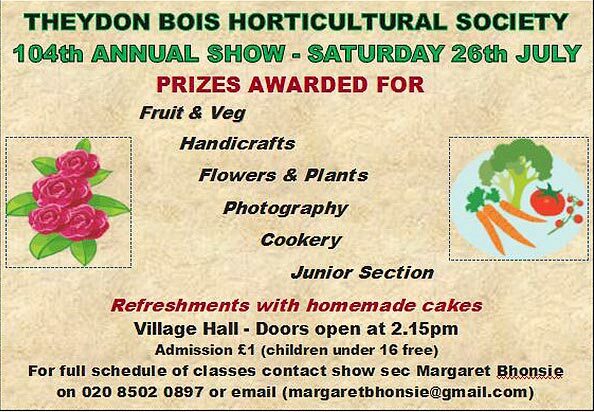 It was good news at last nights well attended Extraordinary General Meeting of the Theydon Bois Horticultural Society. 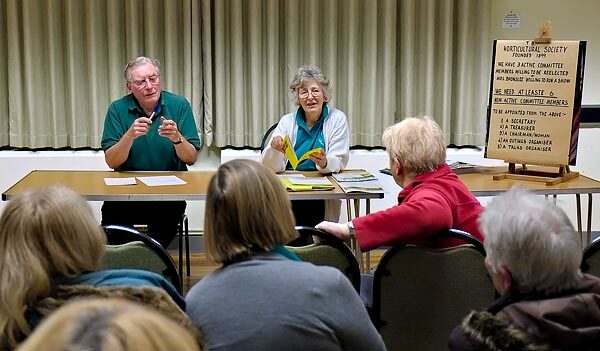 At last year's AGM the Society expressed doubts about their ability to run the Annual Show and carry on due to a lack of committee members following the announcement by Jane & Barry Turner of their retirement from the committee after over 30 years of service. 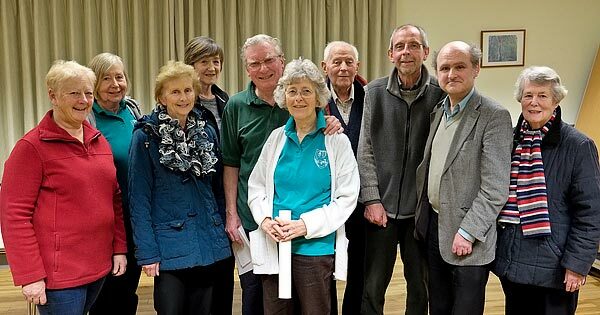 Jane & Barry Turner (centre) with the some of the new officers & committee members. The mood though at this meeting was very positive and a new committee was quickly formed and new officers for the Society appointed. The new committee are: Lee Anderson (Secretary), Chris Jones (Treasurer), Margaret Bhonsie (Show Secretary), Liz McGuire, John Palmer, Diane & Hugh Meteyard, Margaret Jones and Marianne Surguy.The first new committee meeting is scheduled for the 12th February and this will look for ways forward for the Society, but it was agreed that with a new Show Secretary there will be a Horticultural Society Show on Saturday 26th July 2014 and at least one outing, probably to Wisley. Jane and Barry promised to help 'mentor' the new committee drawing on their years of experience.